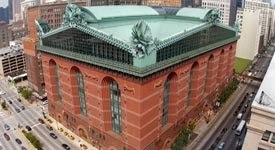 The Harold Washington branch of the Chicago Public Library is a gleaming beacon of libraryness. It doesn't actually gleam because it is made of STATELY BRICK, but you get it. You get it. A city's main library reflects the city. Where its priorities are, and how much of a real city it actually is, as opposed to being just a loose collection of skyscrapers and 7-11s. Harold Washington takes up an entire city block in the Loop, which is part of Chicago's valuable downtown. It's six block from the Sears Tower, five blocks from Millennium Park, and two blocks from Grant Park. It's right off the Blue, Red, Brown, Orange, Pink, and Purple (in rush hour) Lines. AND IT HAS ESCALATORS. Coming from my small town, two-floor library to eight levels of bookish bliss was one of the best parts of the move to Chicago. I'm STILL not over the escalators. Feel like seeing the library sights while not exercising TOO much? Escalator's got you covered. Start on Three with the Information Center and Innovation Lab (THERE IS 3-D PRINTING THERE), and work your way up past Government Publications on Five (are all the reading areas filled up on Seven? no one's on Five, my friend), Social Science and History on Six, Literature & Language on Seven, and Visual & Performing Arts on Eight, which is, ding ding, the last stop. Visual & Performing Arts also has practice rooms. Practice rooms! For free! "It's 6 o'clock; where can I possibly practice my tuba without bothering the neighbors?--The LIBRARY? What? Tell me this is no phantasm or quixotic dream from which I shall soon awake! Free practice rooms -- Oh, that I should be alive in such times as these!" I have neglected Nine (Special Collections Exhibits), because the escalator doesn't go there and it is a mysterious place to me, but I shall be going rightforth and forthwith, because they have a Vivian Maier exhibit now! Vivian Maier! Recently discovered Chicago photographer of fantasticness! I care about basically zero photographers, because my proclivities do not bend that way, but even I can tell that Vivian Maier was a genius at capturing humanity on film. And now I can go look at her photographs for free, because the public library is a wonderful creation and God bless you, Benjamin Franklin. Also escalator-inaccessible is the first floor, because...you walk into it from outside. 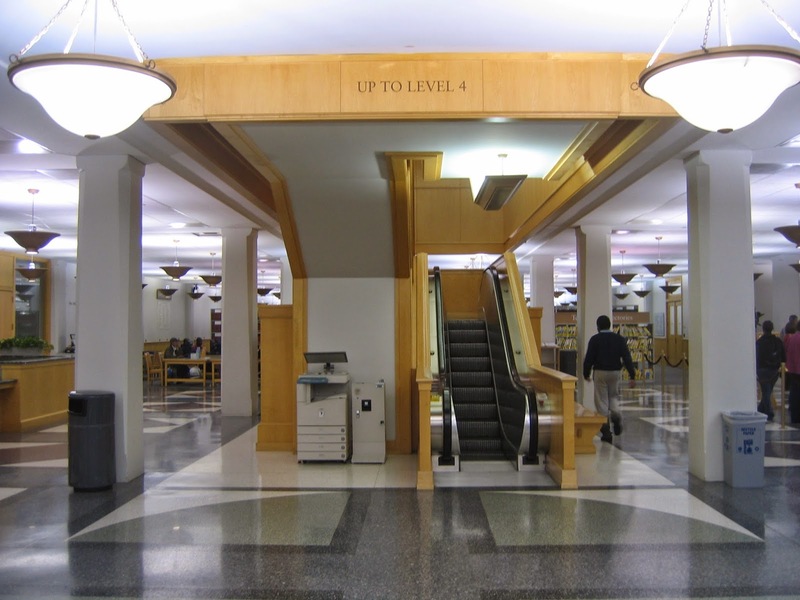 This has the Popular Library, which is where your hold items are conveniently kept. No going up to Three for you, Busy Businessperson! In and out. Bam. It also has something that's been newly created since my move to Chicago: YOUmedia. It's a space on the first floor for teens and young adults, and it encourages them to be creative and gives them a safe place to hang out after school and I am SO PRO THIS PLACE. Can you marry a library system? Hopefully. On the lower level is an auditorium for special events. I've seen Sarah Vowell and, if you will all remember, TREMENDOUSLY UNEXPECTEDLY, Emma Donoghue. I know you're all thinking 'What? How can this all be in one building?' BUT IT CAN, MY FRIENDS. At Van Buren and State. And it is the best.